Well, I soft boiled an egg. So when I opened my fridge and saw a total of 8 ingredients, I knew a pretty simple salad was on the way. I wasn’t to sure how this would work out, but it was actually pretty tasty. And the yellow was so pretty I decided to take a picture and blog about my thrown together salad. I also decided to take the opportunity to try overhead versus 3/4 shots of the salad (my first Penny tip in action!) Thoughts? Preferences? I’m not sure I was really overhead on the first shot, next time I’ll get myself a prop guy to steady me as I take the shots. I’m also not sure I like either picture. I should have used a different surface, but I was hungry, and my linens are packed. If I had more ingredients I would have added something to add a little more contrast to the picture too. Next time. 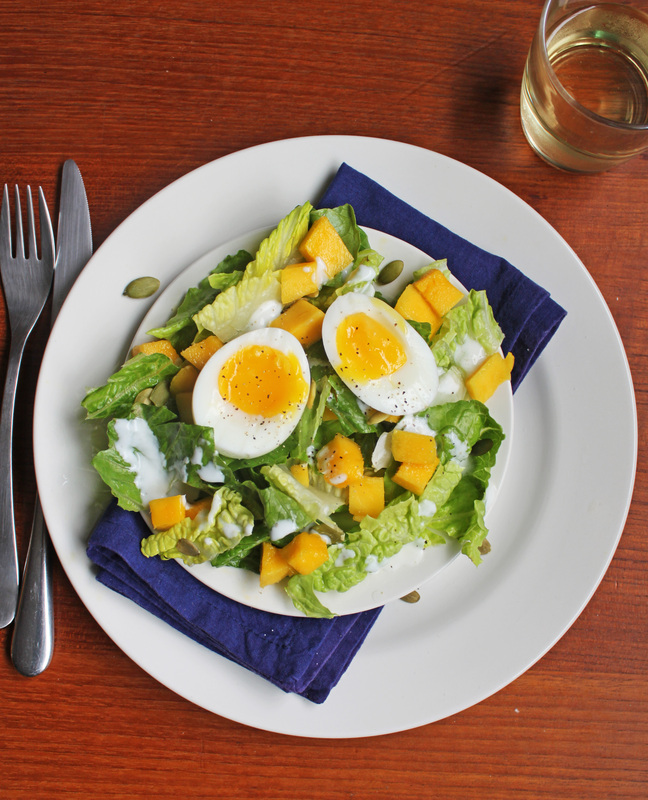 Toss the mango, lettuce and pumpkin seeds together. 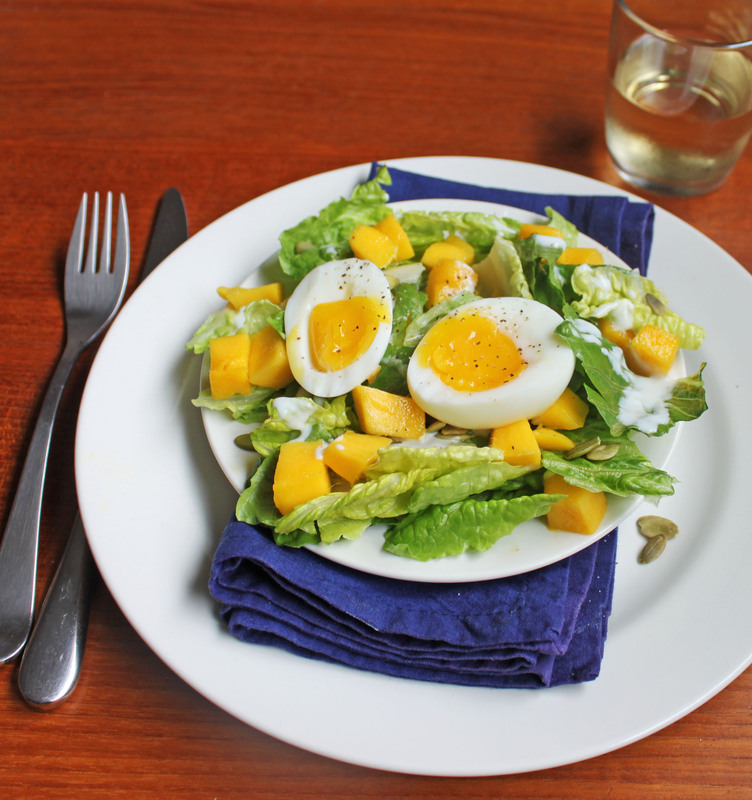 Slice egg in half and place on salad. Mix the yogurt, lemon juice, salt and pepper together. Dress salad with yogurt mixture. I love the overhead action! Totally missed Penny’s workshop though I’ve seen some tweets by friends. Love cooking what’s left in the pantry/refrigerator, too. Cheers! Way to be creative! Necessity is the mother of invention after all! Looks like a wonderful salad, fruity with some protein…has it all! This looks great and so pretty!! If only I could learn to use my new camera and take pictures like this!! dear lord, I love a good soft boiled egg. I’m curious about this mango/egg combination though, must try! Love the matching yellows in the eggs and mango. Pretty! I think your Penny inspired pics look great. We seem to always find things that we would change once we sit down and start editing. Oh and the salad is very creative too. Great combo. Simple, but it looks fantastic! I just ate lunch and I could definitely eat again if this were in front of me.